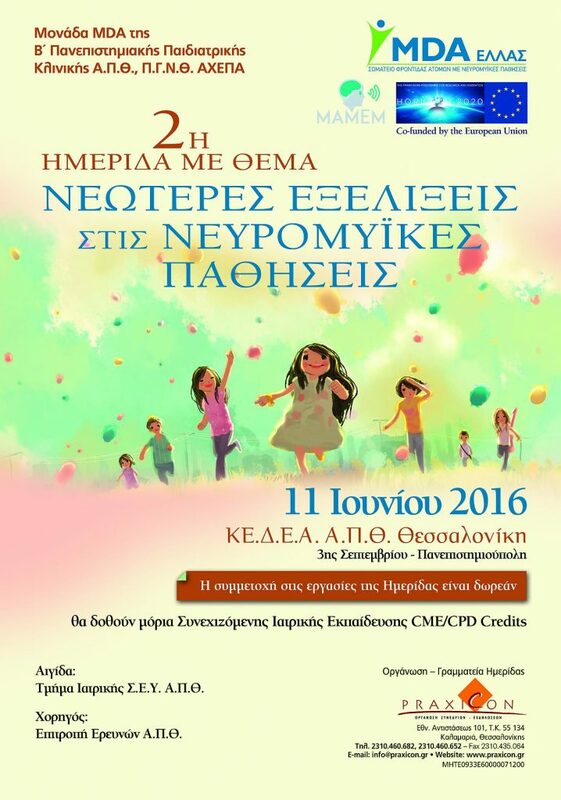 MDAHellas and the B’ University Pediatric clinic of Aristotle University of Thessaloniki, co-organized the 2nd workshop on the latest developments in neuro-muscular disorders in June 11th, Thessaloniki-Greece. With MAMEM being one of its main sponsors and with approximately 170 registrations the workshop was considered very successful! Addressing a mixed audience of patients, care-givers, doctors (with various different specializations) and social workers, the workshop program was structured with the intention to: a) inform the audience about the activities carried-out by the B’ University Pediatric clinic of Aristotle University of Thessaloniki and MDAHellas, b) provide scientific details about the symptoms, the diagnosis, the treatment and the prognosis of related disorders, c) discuss the psychological aspects that come along with this kind of disorders, and d) offer very practical details for the patients’ parents and care-givers, ranging from a quick guide of the disease and how to treat it, all the way to the latest news about the certification process of experimental medication. As part of the workshop program, MAMEM had also the opportunity to give a presentation about its goals, objectives and latest developments, receiving very positive comments and collecting valuable feedback from the audience.